I’m peculiar, it’s true. Change is difficult for me, but when change is necessary I’d prefer it happen quick. Maybe it’s akin to pulling off a band-aid quickly, who knows. Clearly I’m a work in progress! 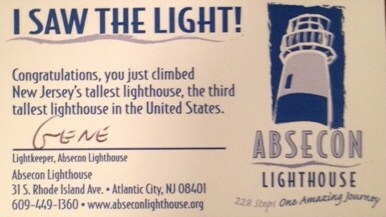 On Monday we visited Absecon Lighthouse in New Jersey. I anticipated reaching the top and enjoying the view. 228 steps to the top, a great learning opportunity on our mini-vacation. On the other hand, climbing 228 steep steps is no easy feat turns out. Can you say thighs burning?! I was NEVER more glad for landings in my life. Every 20 steps or so there’s a landing with a window sill and historical information about the lighthouse. I blew past the first one because I was on a mission to get to the top. By the second landing I suddenly became very interested in those historical facts. Hah! My thighs were screaming! Although I looked forward to reaching the top and seeing the sights, I appreciated the opportunity to pause and recover along the way. It reminded me that some journeys, especially those next level ones, require time AND endurance. The times of decreased activity along the way seem like setbacks, but are actually blessings. Those pauses renew the strength I need to ascend. Given when you reach the top. We all made it to the top (even my five-year old…go girl!) and received a token to mark our experience. I have an additional memento, my thighs are still sore. Apparently my workouts haven’t addressed as much of my quads as I thought! On my next vertical climb, maybe I’ll take even more time to smell the roses! Previous PostDancing ShoesNext PostSilly Rabbit!